I bought the following skirt, which is the tulip skirt in Ratti Happy Cat print, from J. Crew last month. I usually don't buy things from J. Crew that aren't on sale, but this one sold out fast. In fact, my size sold out very quickly and I waited for weeks for it to pop back up in stock, which eventually it did. Apparently, this skirt's print is the Ratti design house's take on an animal print. I'm not sure I would have guessed that unless I read J. Crew's explanation on their website, but regardless I just like the fun colorful dot print, which will go with so many things in my closet. Today I am wearing it with a striped shirt because stripes and dots are usually a no-brainer in the pattern mixing department. I also bought a dress in the same print a couple of weeks ago because, unlike the skirt, the dress went pretty deeply discounted. Since I am obsessed with dresses this summer, I thought it would make for a cool addition to my dress collection, given its spaghetti straps and flowing style. In the fall when I am back at school, just about any colored cardigan will make the dress a perfect addition to my work wardrobe. I have linked to the dress and a cold shoulder top in the Happy Cat print below just in case you love the print as much as I do. The skirt is currently out of stock but like a lot of things at J. Crew, it tends to pop back up from time to time. Such a cute combination of prints and colors! I love this skirt. The print is adorable! I can see why it sold out so quickly! I LOVE this outfit! Such a great skirt! Glad you were able to get it! It's worth it to pay full price for fabulous pieces you love! And how fun that you got the dress, too! looks great. 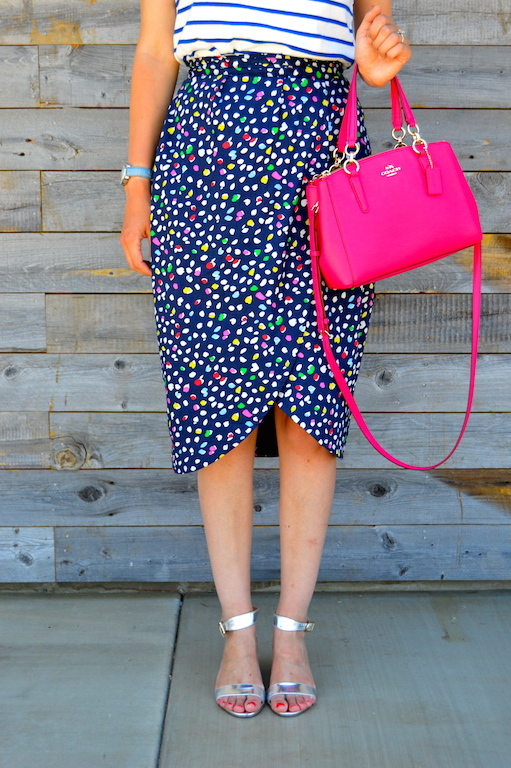 i love the bag color and the print mixing! Love the skirt! 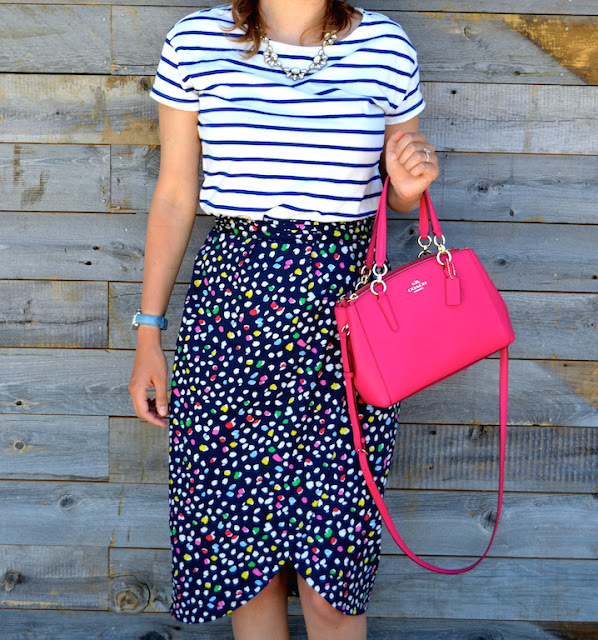 I love all the little pops of color and pairing with the stripes looks fab! I LOVE this outfit! That skirt and top are SO perfect together! And thanks for the explanation about the print - that is really cool, I wouldnt have guessed that either! What a pretty combo! I really love that skirt on you!! I love your skirt and your sun glasses! You create such fun look! I love the skirt on you! I was at J crew today and they had one left in a 00, so sad, none in my size. I did find a few other pieces on deep discount though. Love the shoes on you - those would go with so much! Great look, I love it all! I don't blame you for scooping that one up--the print is so fun and I love the colors! 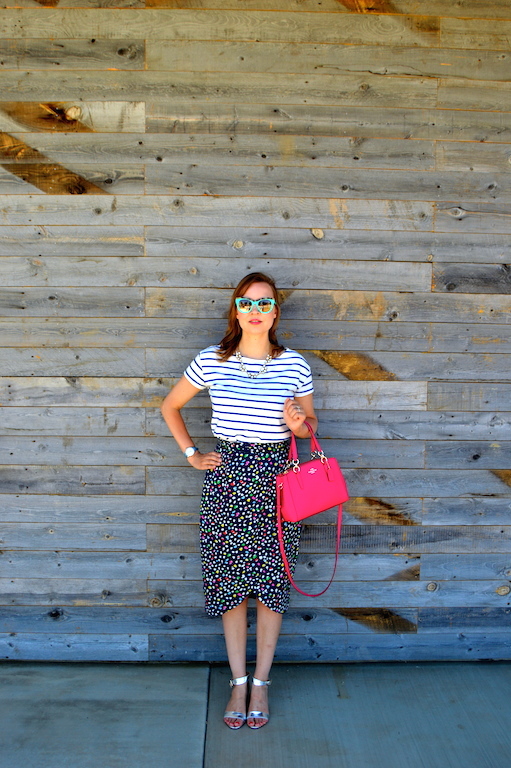 I love it with stripes--you're right, you can never go wrong with a stripes + dots mix. Lots of spotty loveliness! Looks great on you!